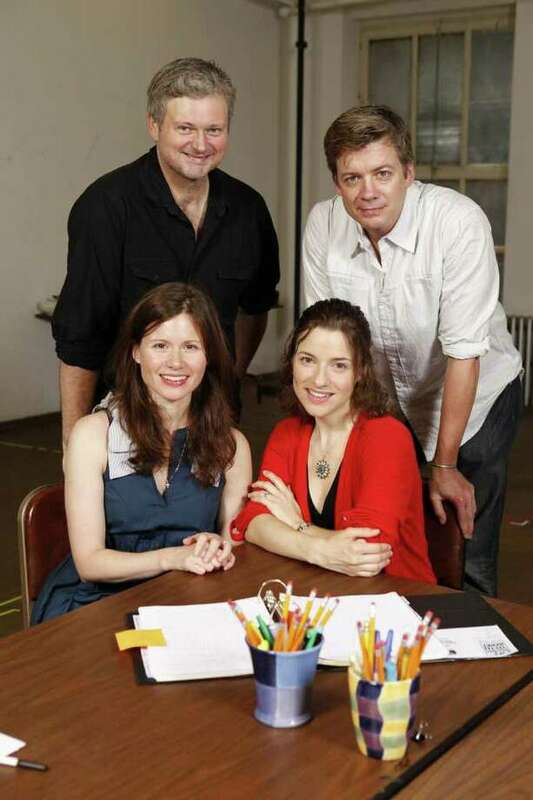 Westport Country Playhouse’s “Lips Together, Teeth Apart,” now in rehearsal, features, from left, seated, Maggie Lacey, Jenn Gambatese; standing, John Ellison Conlee and Chris Henry Coffey. Westport Country Playhouse will stage Terrence McNally's "Lips Together, Teeth Apart," directed by playhouse artistic director Mark Lamos, from July 12 to 30. The third production in the playhouse's 80th year, the play is a comedy with conflicts about two straight couples spending a July weekend on Fire Island. In a beach house, a brother and sister and their respective spouses gather to celebrate the Fourth of July. With food, cocktails, fireworks and barbs, they fortify themselves against their anxieties -- and gay neighbors partying in the houses on either side. The play contains adult content and language. The cast includes Chris Henry Coffey as John Haddock, John Ellison Conlee as Sam Truman, Jenn Gambatese as Chloe Haddock and Maggie Lacey as Sally Truman. The design and production team includes Andrew Jackness, costume design; Robert Wierzel, sound design; Mark Silence, fight director; Matthew Melchiorre, production stage manager; Amanda Spooner, assistant stage manager; and Janet Foster, casting. After "Lips Together, Teeth Apart," the playhouse's five-play 2011 season will continue with "Suddenly Last Summer," a drama by Tennessee Williams and directed by David Kennedy, the playhouse's associate artistic director, Aug. 23 to Sept. 10; and "Twelfth Night, or What You Will," the comedy/romance by William Shakespeare and directed by Lamos, Oct. 11 to Nov. 5. Subscriptions to all three plays are available for preferred seating and discounts of up to 45 percent off single ticket pricing. Students and educators are eligible for 50 percent discounts. All Friday evening performances are $25 for patrons 35 and younger. Groups of 10 or more save up to 30 percent. For group sales information, call 203-227-5137, ext. 120. For information or to purchase tickets, call the box office at 203-227-4177, visit the playhouseat 25 Powers Court or go online to www.westportplayhouse.org.